Cake mix never looked so good. This is another favourite from the Pinterest world. What could be better? Just two ingredients and they’re both basically healthy. Well, angel food cake is low fat and blueberry pie filling...has blueberries... Still healthy, right? Anyways, I had to investigate. This is what happens when I have no time to bake. Which right now, is all the time. I go through the following steps. I want to make a brownie pie. Those are cool. What can I use as a brownie crust that would taste good? And that’s how this recipe was born. Sushi Cupcakes and A RETURN TO BLOGGING! Wow have I ever missed blogging. Who knew? Being a mom and working and blogging is hard or something. And apparently lots of people do that. I’m impressed. I, on the other hand, needed 3 months to catch my breath and finally get to those recipes that I’ve been wanting to share with you for so long. I’ve been baking and experimenting (and eating...), so there is LOTS to share. Thanks for sticking around. It will have been worth the wait. While I had eaten candy sushi (i.e. Rice Krispies rolled into Fruit Roll-ups), I had never had sushi cupcakes. So when I saw these, I knew that I would have to try them. Well, the inevitable has happened. I have returned to work. Like real work where I wake up and leave my house and come home at the end of the day and make dinner and wonder where the day went and want to crawl into bed at 8:30. I might have done that this week instead of publishing this recipe. But this is perfect for those of us who feel (and frankly, are) too busy to bake. Boxed brownies are my go-to. Anyone can stir a brownie mix, egg, oil, and water with a fork and bake for half an hour. Really. It takes 5 minutes to prepare. In fact. Stop reading. Go do that right now. When they told me I could make cake out of just pumpkin puree and cake mix, I was skeptical. I thought the texture would be mushy and wet and that it just wouldn't work. I should have known better. Especially after making cupcakes out of just cake mix and a can of coke. But, as many kitchen experiments go, this one wasn't quite as planned. I was inspired this week by mistakes in the kitchen. They happen to all of us. Particularly those of us who are accident prone. Particularly those of us who are novice bakers. Particularly those of us who have such atrocious kitchen skills that they do not deserve to have blogs about things that happen anywhere near a kitchen. Did I mention that I cannot crack an egg? I actually can't do it. I spend a lot of my baking time picking eggshell out of egg goop. I would provide regular photographic evidence, but I'm petrified of getting egg on my camera. So if you are a poor egg-cracker like I am, then trifle is probably right up your alley. It's the place where all broken cakes get reincarnated into something beautiful and delicious. And if you have a chocolate broken cake, you can make a s'mores trifle. Cupcake toppers are a really easy way to dress up a cupcake. I'm always on the lookout for adorable ways to decorate for special occasions or just for fun. And of course, I'm always looking for really easy ways to do it. 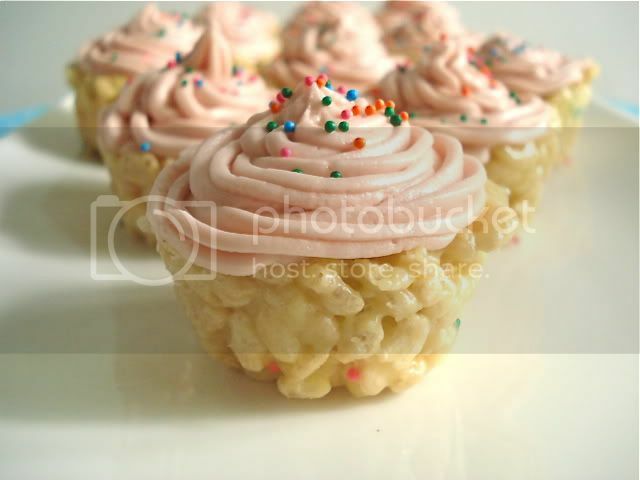 It also makes a simple cupcake that I baked from a box into something special. Cake Batter Fudge - 10 Minute Recipe!